Between the terms of James Knox Polk and Abraham Lincoln, the United States failed to produce a single president whose impact on the country outlasted their tenure in office. To most Americans today, names such as Zachary Taylor, Millard Fillmore, and James Buchanan fail to elicit anything more than a scratch of the head and a shrug of the shoulders. Like these men, Franklin Pierce was certainly not a dominant force in the White House. While he was able to defeat the Whig candidate, Winfield Scott, Pierce proved so inept at his office that he failed to garner the nomination from his own party for the election of 1856. Although his presence had little to do with it, Pierce's presidency introduced themes that would dominate the United States well into the 20th century. Franklin Pierce was the chosen candidate of the Young America Democrats in the election of 1852. These Democrats, such as Lewis Cass of Michigan and Stephen A. Douglas of Illinois, favored unlimited American expansion at the expense of Canada, Latin America, and those European powers that still held colonies in the Caribbean. While such a goal proved too lofty for the divided nation of the mid-1800s, the United States would eventually dominate the entire western hemisphere. In addition, the displacement and migration of numerous citizens in response to the California Gold Rush continued apace throughout Pierce's tenure. The restlessness and aspirations exemplified by the 'Forty-Niners' would not only win the west, but would also characterize the United States' quest for world hegemony in the early 1900s. One cannot help but wonder about the course of American history had the nation been blessed with a strong president during the turbulent years that preceded Fort Sumter. The Liberty Seated dollar is an excellent numismatic representation of Franklin Pierce's personality and presidency. By 1853, the vast quantities of gold that flooded the east raised the intrinsic value of the dollar and depressed its mintage figures. While the denomination had circulated somewhat after its resurrection in the late 1830s, the California Gold Rush ensured that citizens who desired an example of the large silver coin had to pay a healthy premium above its face value. As a result, the coin stopped circulating within the borders of its own country and, like the current president, became a helpless spectator to the events that shaped its times. 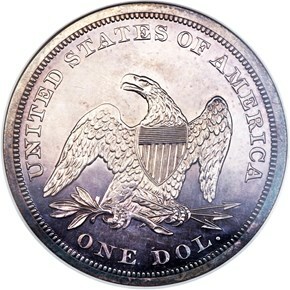 The Seated dollar issues of the 1850s were not, however, completely idle. An excellent example is the 1854 delivery. The Philadelphia Mint shipped the vast majority of the 33,140 business strikes that flowed from its presses this year to various places around the world. Some of these coins followed the droves of United States citizens on the cross-country trek to the gold mines of California. Once there, they served as 'small change' in the years before the San Francisco Mint's output of silver coinage could meet local demands. Still more of these dollars sailed over the Pacific Ocean in the United States' first large shipment of silver coins to the Orient. Clearly, while most American citizens of the early 1850s forgot about the Seated dollar just as easily as they overlooked President Pierce, the coin proved to be an important harbinger of silver's glory days in the China trade and on the western frontier. Their status as trailblazers, however, has not helped the survivability of the 1854 business strike Seated dollars. 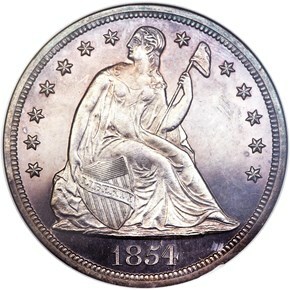 As these coins were either circulated into oblivion out west or melted overseas, Bowers asserts that this issue is the rarest P-mint dollar in the entire series after 1851-1852. The 1854 proof delivery, on the other hand, is one of the largest in the series up to that point. 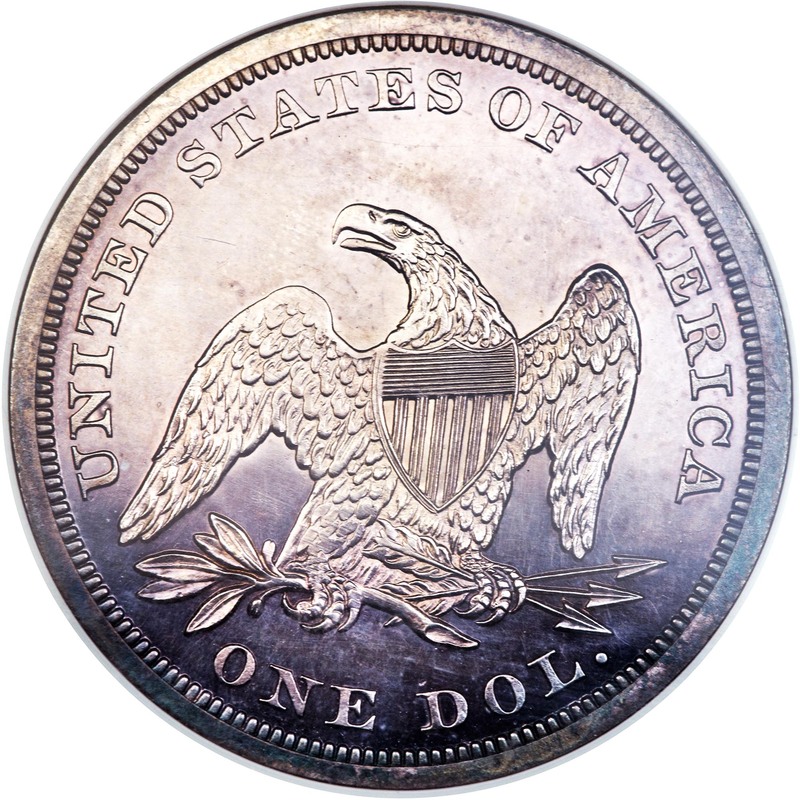 As the federal government made a significant effort to increase its sale of proof coinage this year, the Philadelphia Mint coined somewhere between fifty and one hundred Seated dollars. These coins were sold either individually or as part of five-piece silver proof sets. Lest a collector make the assumption that they can easily fill the hole in their date set of Seated dollars with an 1854 proof specimen, we caution bidders that there are probably fewer than three dozen extant survivors of this early presentation delivery.